While I sometimes enjoy getting carried away in the kitchen, preparing elaborate dishes with myriad ingredients, there are days when I just need to get something healthy and tasty on the table FAST. Having Saslove’s, a great butchery with a well-stocked selection of fish, just a couple of blocks from my house is a big help, in terms of both quality products and inspiration. When I saw gorgeous organic trout fillets there the other day, I knew exactly what we would be having for dinner. Trout has a very mild flavour and is often popular with people who are not big fish fans. The fillets cook very quickly under a hot broiler; if you prefer, you can grill them for about the same amount of time but be sure to oil your barbeque’s grates so the fish doesn’t stick. 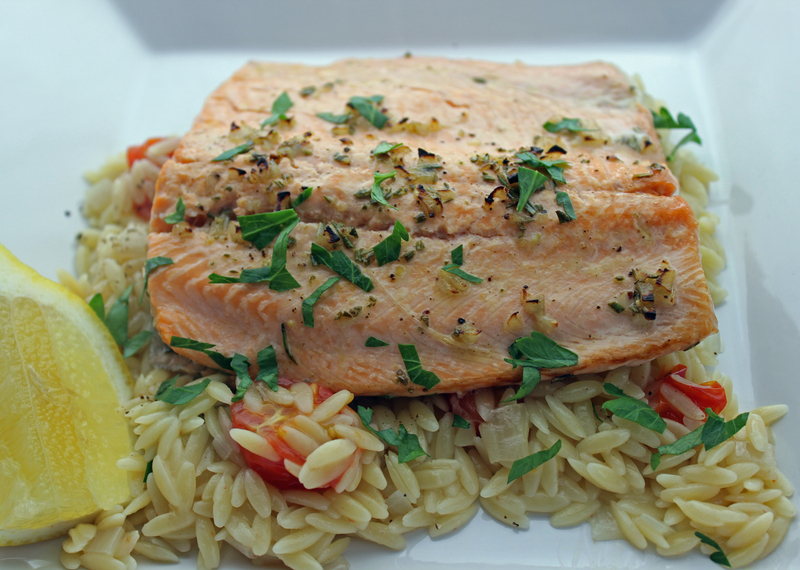 I served the seasoned trout on a bed of orzo cooked in vegetable broth with some shallots and halved cherry tomatoes tossed in; we found it to be a great accompaniment for the fish. Trout is a mild flavoured fish with a delicate texture; pairing it with herbs and garlic then quickly broiling or grilling makes it super delicious! Preheat broiler (or barbeque, if using). Put oil and butter in a small saucepan. Over medium-low heat, cook garlic in the oil and butter. After garlic has softened, add rosemary and a bit of salt and pepper to the pan. Cook for 1 – 2 minutes then remove from heat and add lemon Juice. Cut the fillet into two equal portions and lay them in a glass or ceramic broiler safe dish. Drizzle the sauce over the fillets. Broil or grill for 5 – 7 minutes, until fish flakes easily and internal temperature of the thickest part is 155F. If one of the fillet pieces is a bit thinner, it may cook more quickly so you may need to remove it from heat and let the other piece cook a minute or two longer. Serve fish over orzo, rice, salad or potatoes with a sprinkle of parsley and a wedge of lemon. This entry was posted in fish, Meat, poultry, fish, Recipes and tagged broil, butter, easy, eat more fish, fast, fish, garlic, grill, lemon, mild flavoured, non-fishy, rosemary, trout. Bookmark the permalink.